Does Your Cat Really Like Laser Pointers? We know cats are formidable hunters by nature. But did you know that a cat’s best asset is its ears which can detect 64kHz and can move independently from each other at 180 degrees each? In addition to their keen ears, eyes, and nose, domestic cats still have their hunting instincts even with all the free foods humans give them. They display their hunting instincts when they hunt for snacks, as well as when cats play, especially when laser pointers are involved. So the question is – why do cats chase lasers? Do they really like laser pointers? Cats belong to the family Felidae, predatory carnivorous mammals whose mode of hunting is through ambush, stalking, and short pursuits. Their bodies are definitely built for hunting, with eyes that can detect and follow rapid movements, ears that can easily pick up sounds, and a nose that can process long-term memory scent data. Kitties learn to hunt from their Mama cat at a young age. The Mama cat will bring mice, birds or any kind of food; whether dead or alive, for the kittens to play and eat. As the baby cats grow older, they get to see their mother in action. In addition to parental influence, felines also have the natural instinct to chase and play moving objects. This is because cat’s eyes are designed to follow things and subjects that move at high speeds while those that move slowly may appear stagnant in their eyes. In addition, domestic cats have 20/100 vision and a peripheral vision of 200 degrees – compared to ours which is normally 20/20 and 180 degrees. Their eyes have 6 to 8 times more low light-sensitive rod cells than humans which allows them to hunt well during night time. All these combined allow cats to see distances clearly at two or three feet as well as properly track darting and scurrying movements. Because cats’ eyes are well suited for tracking, darting, and scurrying objects, they find laser pointers the purrfect quarry – at least, supposedly. Laser pointers tend to rapidly dart from one section of the room to another, or suddenly disappear as the kitty tries to jump on it, only to reappear a split second later nearby for the cat to resume the chase. This makes playing with laser pointers good for the kitty’s physical exercise. It also keeps cats mentally stimulated since they have to find ways to stalk and catch the moving dot of light. As a group activity, a group of cats playing with the laser light will allow them to develop their social skills, creating boundaries and group coordination between members of the clowder. And for parents like us, especially if we are unable to move so much around, laser pointers are good toys. The problem with laser pointers is that they create only a beam of light. Remember what was said at the beginning? Cats have good ears that can rotate at 180 degrees and pick up sounds that humans cannot. Laser pointers provide visuals but they do not provide the sound aspect. Even if you are to create some noise from your end, this is detached from the laser pointer itself. Cats also have a keen sense of smell – and laser pointers do not have a scent. This means, then, that only the visual stimulus of the cat is trained and not the other senses; which means the use of their hunting instincts is not maximized which can lead to discontent especially when coupled with the next factor. In the wild, and for any wild animals at that, part of the joy of the hunt is the fulfillment of capturing their prey. In games with laser lights, however, the simulation of the hunt is imperfect since there is no capture. A kitty may be able to tap on the area with the laser light, but the light itself disappears and reappears, instead, on top of the feline’s paws or on some other area of the playing field. The cycle between chase-disappear-reappear continues on and on until the cat becomes frustrated. Worse would be if the human involved forgets the purpose of the play and focus teasing the cat instead. When this happens, the feline can get so frustrated that it gets aggressive. This aggression may end up in a cat fight if the play is done in a group, or worse, into torn furniture, broken figurines and vases, and the like. This does not mean, however, that laser pointers are already useless as toys. There are just a few things that one has to remember when playing with the laser pointer for your cat. Laser pointers are not the only toys around. Please remember that laser pointers can be one of the many toys your kitty can have and enjoy. You need to give your cat different kinds of toys that can help develop different aspects of your cat’s cat-ness. Feather toys, for example, would stimulate a kitties’ sense of touch and scent. It also stimulates their ancestral bird-hunting instincts. Catnip toys have catnip and can tickle their nose and give them a certain high. There are even those that are shaped like animals like fish and mice, as well as bugs. Cats are also smart and when they feel like it, they play puzzle toys, too. These help them stimulate their mental abilities as natural hunters. For human-cat interaction, the best toy would probably be pole or wand, especially since the end of this kind of plaything happens to have something fuzzy or feathery that can give both visual and tactile stimuli for your cat. In addition, playing with your cats with pole toys will allow you to train them which direction you wish them to go. Just make sure to have kitty treats ready for some reward. You may even combine all these toys and set up a complex system to stimulate all your cat’s senses as well as mental abilities. Make sure, however, to consider its age and development ability. 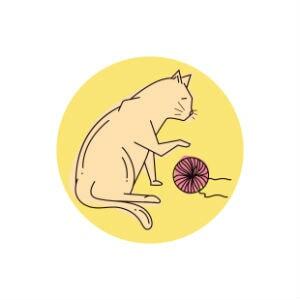 Just like training your kitty, start with simpler things and level up the complexity as you go. When you play with the laser pointer with your cat, allow the kitty to capture the laser pointer. Have the laser pointer stay in one place long enough for the cat to feel and smell the toy. You may even put some hidden treats within the toy itself so that the cat can linger a bit and enjoy the treat, before letting the beam distract it again. In addition to an occasional “hidden treat”, give your cat a good snack after a “final” showdown with the “prey.” In this manner, the kitty is able to enjoy a hunting simulation that involves the reward of a hunt, giving it satisfaction. Always remember that playing with your cat is not for you to exercise power but for you to help it keep its hunting instincts from getting rusty. You are also there to strengthen bonds with your feline. Let’s face it – kitties own their hooman; not the other way round. If the kitty loses its sense of control and starts developing anxiety, it would either be destructive within the play area or start spraying just to reestablish a sense of control. In addition, a hunt with no reward might make it hungry later on – enough to bring you dead critters from its hunt. Don’t shine the laser pointer at your kitty’s eye – nobody, not even your cat – will want to go blind! Your kitty is your friend and as friends, you are also its companion in its hunt. When playing with your pet, it is good to see it at its level in order to understand your cat more and help it develop its instincts. This will not only reward you with a stronger bond later on; it will also keep you from getting your house destroyed, too.